NetApp customers have saved more than five exabytes* (that’s over five million terabytes) of capacity in just the past three years using NetApp storage efficiency technologies. We are so confident that the V-Series open storage controllers will increase your storage efficiency and reduce your total storage bill that we guarantee it will pay for itself in nine months. *Based on system data from the NetApp AutoSupport™ tool. This article is the eighth installment of Back to Basics, a series of articles that discuss the fundamentals of popular NetApp® technologies. IT teams choose NetApp because of innovative capabilities that simplify data management and drive down costs. In 2003, NetApp introduced its V-Series open storage controllers as a way to bring the full suite of NetApp capabilities to non NetApp storage. The V-Series provides full storage virtualization for storage arrays from EMC, HP, HDS, IBM, and Fujitsu, allowing you to take advantage of NetApp storage efficiency, Integrated Data Protection, unified storage, and other capabilities without sacrificing your existing storage investment. Today, over 10,000 V-Series controllers are in use at over 2,000 customer sites. V-Series reduces your total capacity requirement by at least 35% and typically by 50% or more using storage efficiency features such as deduplication on primary storage, thin provisioning, compression, and cloning. Integrated Data Protection (IDP) features simplify and accelerate data protection operations. 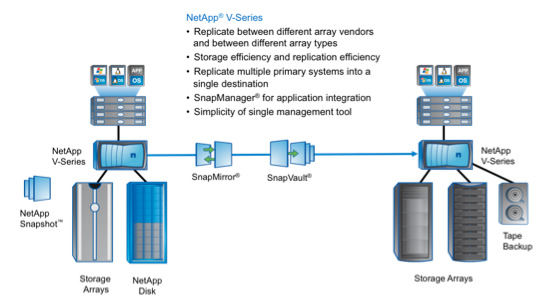 Examples include NetApp Snapshot™ copies, SnapMirror® replication, SnapVault® disk-to-disk backup, and virtualization-aware and application-aware data protection with the SnapManager® suite. Connecting your existing storage array(s) to V-Series can provide a gateway that allows you to support all common NAS and SAN protocols including NFS, CIFS, Fibre Channel (FC), iSCSI, and Fibre Channel over Ethernet (FCoE). V-Series controllers are able to run clustered Data ONTAP® 8, so you can include your existing storage arrays as part of a NetApp cluster for even greater functionality. V-Series can be included as part of a FlexPod® configuration, allowing you to incorporate your existing storage into the FlexPod framework. V-Series helps you deliver greater storage efficiency and functionality from your existing storage arrays. This chapter of Back to Basics explores how NetApp V-Series works, common use cases, best practices for deployment, and more. Logically, you can think of V-Series configurations as having a front end and a back end. The front end includes everything internal to the V-Series controller, plus connections to hosts, to tape devices, or between V-Series and FAS controllers. The back-end configuration defines how the V-Series attaches to the storage arrays themselves, providing a virtualization layer between the storage array and hosts. For the back-end configuration, you create LUNs on your storage array and present them to the V-Series. (Best practices for back-end configuration are discussed in the section “Getting Started with V-Series,” later in this article.) The LUNs presented to V-Series are RAID protected by the storage array, typically using RAID 1, RAID 5, or RAID 6; the option is up to you. The V-Series controller uses the LUNs assigned to it to create an aggregate (storage pool). RAID 0 (striping) is used to stripe data across all LUNs in an aggregate, enabling writes to be spread across all LUNs for performance. Once LUNs are configured and attached to the V-Series, tasks such as provisioning and data protection are performed on the V-Series using NetApp interfaces and functionality, giving you a single interface for storage management tasks. From a management perspective, the V-Series looks like and is managed like any other NetApp system. You can create flexible volumes (FlexVol® volumes); NFS and CIFS shares; and iSCSI, FCP, and FCoE LUNs just as you would on NetApp disk. You can also use storage efficiency features like thin provisioning, deduplication, compression, and cloning, and Integrated Data Protection features including Snapshot, SnapMirror, and SnapVault. You can replicate between V-Series systems or between a V-Series and a FAS system. 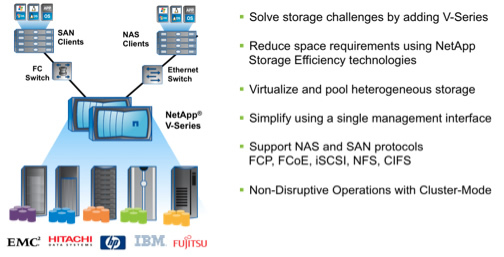 Essentially, anything you can do on a NetApp FAS system you can do on a V-Series system. 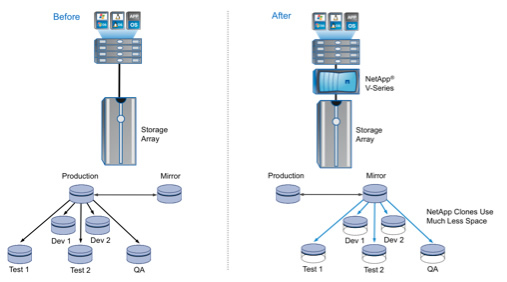 Figure 2 illustrates the difference between a V-Series aggregate created from third-party storage and one created from NetApp disk. 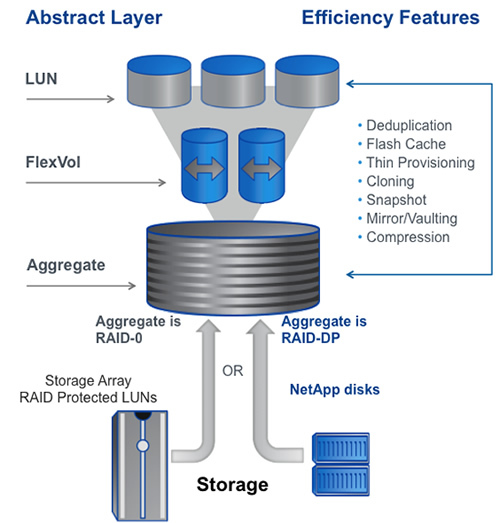 Note that other than RAID-DP® technology, all the NetApp efficiency functionality exists at the aggregate level or higher and therefore applies to V-Series aggregates as well as the NetApp volumes and LUNs built on top of those aggregates. Figure 2) V-Series logical view. Here are a few finer points of the V-Series architecture that are easy to overlook. NetApp disk is supported. Since Data ONTAP 7.3 became available, it’s been possible to add NetApp disk shelves to an existing V-Series system. This gives you more flexibility if you need to add capacity to your V-Series configuration. You can virtualize part of an existing array. You don’t have to attach all the storage from your existing array to V-Series. You can assign some array LUNs to V-Series and other array LUNs to other hosts. You can put multiple arrays behind V-Series and the arrays can be from different vendors. Having to manage storage from multiple vendors can be complicated. Putting a V-Series in front of a set of heterogeneous arrays provides a single point of management and a uniform set of capabilities, and it simplifies management tasks. You can use several V-Series systems as a front end to a single array. Depending on your needs you can put several V-Series controllers in front of a single back-end array. For instance, you might put several smaller V-Series controllers in front of a very large array. 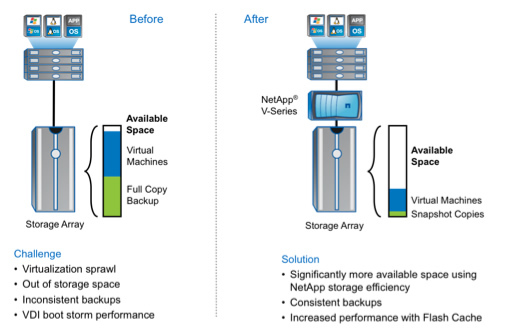 You can optimize V-Series performance with the NetApp Virtual Storage Tier. The NetApp Virtual Storage Tier lets you deploy Flash at the V-Series-controller level (Flash Cache), aggregate level (Flash Pool on NetApp disks), and server level (Flash Accel™ technology) to further optimize performance while minimizing cost. V-Series works with clustered Data ONTAP 8. Clustered Data ONTAP 8 allows you to join up to 24 NetApp controllers into a single cluster. It provides a wide range of capabilities that can make your IT infrastructure more agile. Including V-Series controllers in such a cluster allows you to encompass your existing arrays in an advanced cluster. Nondisruptive data migration means that all necessary maintenance and management can be performed without the need for planned downtime, increasing the agility of your data infrastructure. FlexPod configurations can incorporate V-Series. Converged infrastructure solutions like FlexPod streamline the process of deploying new IT infrastructure. Including a V-Series controller in your FlexPod configuration allows you to leverage your existing storage capacity. Most virtualized environments have dozens or even hundreds of copies of the same operating systems. This high degree of duplication makes both virtual server and virtual desktop (VDI) environments perfect targets for efficiency improvements with V-Series. If your virtual environment is hosted on a storage array that doesn’t support deduplication, adding NetApp V-Series controllers will allow you to reclaim significant amounts of storage that can be reused to meet other needs, reducing your overall storage investment. Typically from 50% to 80% of the storage allocated for virtual machine operating environments can be freed for reuse. Figure 3) Using V-Series in a virtual environment. Once a virtualized environment is migrated to V-Series, you can continue to use your existing provisioning methods combined with deduplication, or you can provision virtual copies using NetApp FlexClone® technology to maintain the space efficiency of your virtual environment. The NetApp Virtual Storage Console streamlines this process for VMware® environments, and the NetApp OnCommand® Plug-in for Microsoft® does the same thing for Hyper-V™. Flash Cache —part of the NetApp Virtual Storage Tier—can be used in virtualized environments to improve performance, especially during boot and login storms. Array-based replication solutions for disaster recovery typically require source and target array configurations that are the same. Different array models from the same vendor may not be supported, and if you need to replicate between arrays from two different vendors all bets are off. By using V-Series as a front end to your existing storage arrays, you can achieve your replication goals while reducing bandwidth requirements. NetApp SnapMirror software replicates only blocks that have changed, increasing replication efficiency. SnapMirror compression further reduces network bandwidth consumption. Deduplicating primary data further reduces the amount of data to be replicated. Figure 4) V-Series Integrated Data Protection for heterogeneous storage environments. V-Series can provide local Snapshot copies, replication with SnapMirror, and disk-based backup with SnapVault. Development and test, quality assurance, data warehousing, and other operations in database environments typically require many copies of production databases. These consume significant amounts of storage—not to mention power, cooling, and data center space. In addition, the time needed to create a full database copy can be prohibitive. These limitations often dictate the way work gets done as developers and testers work with too few copies and with datasets that are out of date. The virtual copy capability supported by NetApp V-Series controllers with NetApp FlexClone lets you correct this situation, reducing the amount of storage needed to a fraction of what would otherwise be required and allowing you to create a usable database “copy” in minutes. For example, dev/test for a 100GB production database usually starts with a full mirror and then several copies for developers and several for testers. If we conservatively assume that two are needed for developers and three for test and QA, the total storage requirement (including the production database) is 700GB. Retaining the full mirror (to avoid any impact on production storage) and using FlexClone for the dev/test copies reduce the total storage requirement to just 250GB—a 64% reduction in storage required. (This assumes that the average change rate in dev/test volumes is about 10%.) The total time to create these copies is also reduced to a matter of minutes versus many hours. Figure 5) Using V-Series in a development environment. Sometimes you have capacity available on block-based storage arrays, but you need NAS. One possibility is to configure traditional file servers, but this can result in server sprawl, high latency, and poor reliability. In other situations you may need or want to use a SAN protocol such as iSCSI or FCoE that isn’t supported by your existing array. With the ability to serve both SAN and NAS protocols at the same time, NetApp V-Series is the ideal gateway. A single V-Series controller can take the place of large numbers of file servers, reducing cost and complexity while increasing availability. At the same time it can also provide popular SAN protocols including FC, FCoE, and iSCSI. It may seem counterintuitive that a V-Series in front of an existing storage array would yield better performance, but because of the additional level of controller cache and NetApp technologies such as write anywhere file layout (the WAFL® file system) and Virtual Storage Tiering, V-Series can actually drive significantly more I/O operations per second (IOPS) per drive than a native array alone. In a recent study, the Enterprise Strategy Group demonstrated that a V-Series V3270 in front of a third-party array was able to deliver three to six times more IOPS at much lower latency than the array alone on common workloads such as OLTP, Exchange, file services, and Web services. In all cases the datasets were deduplicated, and performance gains were due in large part to deduplication-aware caching on the V-Series. Adding Flash Cache to the V-Series further increased performance with gains of five to eight times over the array by itself. V-Series with Flash Cache installed can be particularly beneficial in VDI environments in which boot storms and login storms can swamp a traditional storage array. Once you’ve made the decision to deploy V-Series, configuring your environment is a pretty straightforward process. Attention to a few simple guidelines will help enable success. Review the NetApp Interoperability Matrix Tool (IMT) (requires NOW® access) so that your storage array(s), switch(es), and microcode versions are supported with V-Series. Configure new LUNs on each storage array that will be used with V-Series. Attach the LUNs to your V-Series controllers. Follow the best practices detailed in NetApp TR-3461: V-Series Best Practices Guide, particularly the best practices for cabling, zoning, and providing paths to array LUNs. Once V-Series is configured, you can migrate data onto it using the appropriate tools. For instance, Storage vMotion® provides a convenient way to migrate VMware® virtual machines. V-Series works with the same set of NetApp technologies as NetApp FAS platforms—that’s really the point. There are very few limitations. As already mentioned, RAID-DP is only used with NetApp disk shelves (LUNs from storage arrays are protected on those arrays). Other than that, you can take full advantage of all the familiar NetApp functionality with the storage you already own. NetApp V-Series open storage controllers are designed to bring the benefits of NetApp storage efficiency, Integrated Data Protection, unified storage, and other capabilities to storage arrays from EMC, HP, HDS, IBM, and Fujitsu. Deploying V-Series as a front end virtualizing these arrays can provide significant benefits. You can greatly reduce the total amount of storage needed in virtualized environments and improve performance. Your dev/test operations can have more up-to-date copies of critical datasets, improving time to market. In addition, with V-Series you can replicate between heterogeneous arrays and utilize NAS or SAN protocols not supported by your existing storage. To learn more about NetApp V-Series, refer to NetApp TR-3461: V-Series Best Practices Guide, and the recent ESG Lab Validation Report, which describes testing of various V-Series features including capacity savings in a VMware environment and performance relative to the third-party array by itself. You can also check out the V-Series Integration Guide for Data ONTAP 8.1.1 (requires NOW access). Steve has been with NetApp for more than 13 years. In mid-2003, he began working with large NetApp customers who wanted to leverage NetApp features with their existing storage arrays and in traditional SAN environments. These early adopters helped start the V-Series product line. In 2006, Steve took on a role with the product team, using his field experience to further drive the evolution of the V-Series product.